Having a customized logo on your TOYT dental floss dispensers means your customers will see and think about your business at least once or twice a day. This is truly "high-impact" marketing! 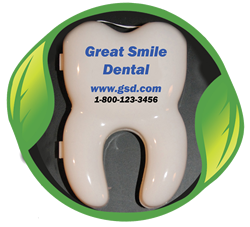 Your business's name(logo), slogan, phone number, website can be included on this refillable dental floss dispenser to market your company or organization! Because we live in a world where it's almost impossible to get continuous "face time" with customers, the mountable TOYT dental floss dispenser acts as a constant reminder of your business. In addition, the TOYT dental floss dispenser uses high quality floss refill spools, so your business will continue to be marketed to customers for years to come. No need to spend money year after year, on the next marketing novelty item--- which ends up lost in a drawer or in the garbage. Stretch your marketing dollars and choose the TOYT mountable dental floss dispenser! Now your organization is visible to your customers day and night! Please contact us at info@toytgroup.com or 1-877-254-3613 to discuss the incredible opportunity!